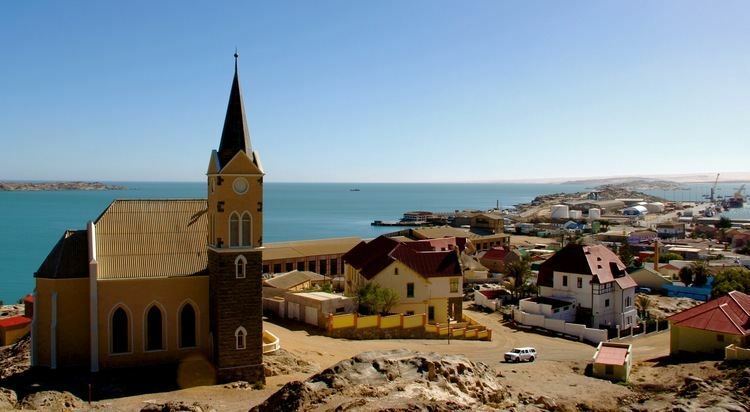 Lüderitz is a harbour town in the ǁKaras Region of southern Namibia, lying on one of the least hospitable coasts in Africa. It is a port developed around Robert Harbour and Shark Island. In 2013, it was announced that Lüderitz was renamed into ǃNamiǂNüs. This pertains only to the constituency, however. The bay on which Lüderitz is situated was first known to Europeans when Bartolomeu Dias encountered it in 1487. He named the bay Angra Pequena (Portuguese: Small Bay) and erected a padrão (stone cross) on the southern peninsula. In the 18th century Dutch adventurers and scientists explored the area in search of minerals but did not have much success. Further exploration expeditions followed in the early 19th century during which the vast wildlife in the ocean was discovered. Profitable enterprises were set up, including whaling, seal hunting, fishing, and guano-harvesting. Lüderitz thus began its life as a trading post. The town was founded in 1883 when Heinrich Vogelsang purchased Angra Pequena and some of the surrounding land on behalf of Adolf Lüderitz, a Hanseat from Bremen in Germany, from the local Nama chief Josef Frederiks II in Bethanie. When Adolf Lüderitz did not return from an expedition to the Orange River in 1886, Angra Pequena was named Lüderitzbucht in his honour. In 1905, German authorities established a concentration camp on Shark Island The camp, access to which was very restricted, operated between 1905 and 1907 during the Herero Wars. Between 1,000 and 3,000 Africans from the Herero and Nama tribes died here as a result of the tragic conditions of forced labour. Their labour was used for expansion of the city, railway, port and on the farms of white settlers. In 1909, after the discovery of diamonds nearby, Lüderitz enjoyed a sudden surge of prosperity due to the development of a diamond rush to the area. In 1912 Lüderitz already had 1,100 inhabitants, not counting the indigenous population. Although situated in harsh environment between desert and Ocean, trade in the harbour town surged, and the adjacent diamond mining settlement of Kolmanskop was built. After the German World War I capitulation South Africa took over the administration of German South West Africa in 1915. Many Germans were deported from Lüderitz, contributing to its shrinking in population numbers. From 1920 onwards, diamond mining was only conducted further south of town in places like Pomona and Elizabeth Bay. This development consequently led to the loss of Lüderitz' importance as trade place. Only small fishing enterprises, minimal dock activity, and a few carpet weavers remained. In an effort to remove colonial names from the maps of Namibia, in 2013 the Namibian government renamed the constituency ǃNamiǂNûs, its name prior to 1884. The harbour has a very shallow rock bottom, making it unusable for modern ships; this led to Walvis Bay becoming the centre of the Namibian shipping industry. Recently, however, the addition of a new quay has allowed larger fishing vessels to dock at Lüderitz. The town has also re-styled itself in an attempt to lure tourists to the area, which includes a new waterfront area for shops and offices. Just outside Lüderitz lies the ghost town of Kolmanskop, a prominent tourist destination. This previously bustling diamond town is now abandoned, and fights a constant struggle against being buried under the shifting sand dunes of the Namib desert. The coastline in the area is recognised by Bird Life and other global conservation groups as one of the Important Bird Areas (IBAs) for important coastal seabird breeding. Mercury Island, Ichaboe Island, Halifax Island and the Possession Islands support the entire Namibian breeding population of Cape gannets (Morus capensis), 96% of the Namibian population of the endangered African penguin (Spheniscus demersus), and nearly one quarter of the global breeding population of crowned cormorants (Microcarbo coronatus). Approximately 80% of the global population of the endangered Bank cormorant (Phalacrocorax neglectus) breeds on Mercury Island and in the Ichaboe Islands. In April 2009, an oil spill from an oil tanker risked hundreds of African penguins and other flora and fauna. Several species of cetaceans, most notably Haviside's dolphins, can be seen close to the shore while larger whales such as southern right, humpback, minke, fin, pygmy right, are less common but gradually increasing in numbers. Lüderitz has a mild desert climate (BWn, according to the Köppen climate classification), with moderate temperatures throughout the year. The average annual precipitation is 17 millimetres (0.67 inches). Windy and cold conditions can occur due to the cold South Atlantic current on the coast. Lüderitz is home to the Lüderitz Speed Challenge, the only international sporting event held in the town. This is an annual month-long speed sailing event held in the last quarter of the year under the auspices of the International Sailing Federation (ISAF) World Sailing Speed Record Council (WSSRC). In 1984 Lüderitz was the starting point for explorer and sailor Amyr Klink's successful solo crossing of the Atlantic Ocean, rowing for 101 days all the way to the Brazilian coast with no other form of propulsion. In October 2011, Turkish-born American adventurer Erden Eruç departed from Lüderitz Bay for the final ocean crossing of his Guinness world record-setting solo human-powered circumnavigation of the Earth. Eruç rowed to South America in an oceangoing rowboat, taking five months for the crossing to the town of Güiria, Venezuela. Construction of a new port at Shearwater Bay, 30 kilometres (19 miles) south of Lüderitz, has been proposed for the export of coal from Botswana with a 1,600-kilometre (990-mile) railway connecting the two. Lüderitz is the terminus of the 318 kilometres (198 mi) railway line to Seeheim where the railway connects to the rest of the country's network. This line, built by inmates of the concentration camp on Shark Island, was completed in 1908 but is currently not operational. Rebuilding of a remaining 47 kilometres (29 mi) track gap to Aus has been delayed since 2009. Lüderitz has a local monthly newspaper, Buchter News. The paper, which was started as a source of free English-language reading material, is run by volunteers from the British gap year charity Project Trust. Lüderitz is governed by a town council that currently has seven seats. Previously the German school Deutsche Schule Lüderitzbucht was in the city. In 1965 it had 13 teachers and 140 learners and was supported by German government. Felsenkirche (English: Rock Church) on Diamond Hill, a church in vertical gothic style consecrated in 1912. After the diamond rush of 1908 and the completion of the railway line to Keetmanshoop Lüderitz became permanently home to a significant white population. As a result, a number of churches were built. Felsenkirche, one of the oldest Lutheran churches in Namibia, is a national monument since 1978. Krabbenhöft & Lampe building, after co-owners Friedrich Wilhelm Krabbenhöft and Oscar Lampe. The predecessor of this business, the Handelsstation F.W. Krabbenhöft in Keetmanshoop, existed since 1880 and was one of the first formally registered businesses in South West Africa. Erection of the building started in late 1909, it is a national monument since 1979.